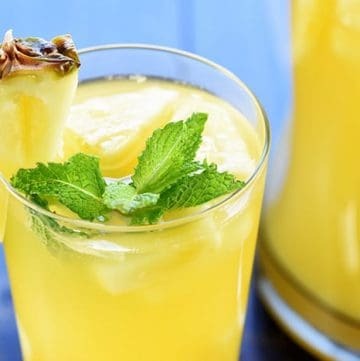 Sparkling Pineapple Sangria is a bubbly, refreshing, tropical summer cocktail made with just five ingredients, perfect for poolside, parties, and BBQs! Helloooo, summer! Well, not quite technically, I suppose. But school is winding down and the days are heating up so it won’t be long now! What say we celebrate? If this Sparkling Pineapple Sangria doesn’t put you in a summer state of mind, I’m not sure what will. I’ve long been a fan of sangria of any kind, but during the sweltering months of summer, white sangria tends to capture my heart. Whether loaded with peaches or berries or apples and citrus, sangria made with chilled white wine is a light and refreshing way to cool down when the outdoor temps are a-blazin’. 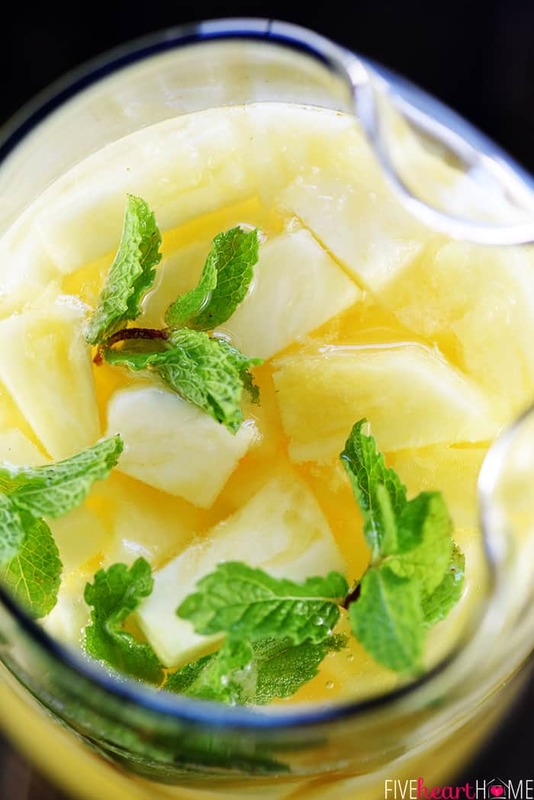 But since summer goes hand-in-hand with all things tropical, why not enjoy a sangria where pineapple is the star of the show? And add bubbles, to boot??? 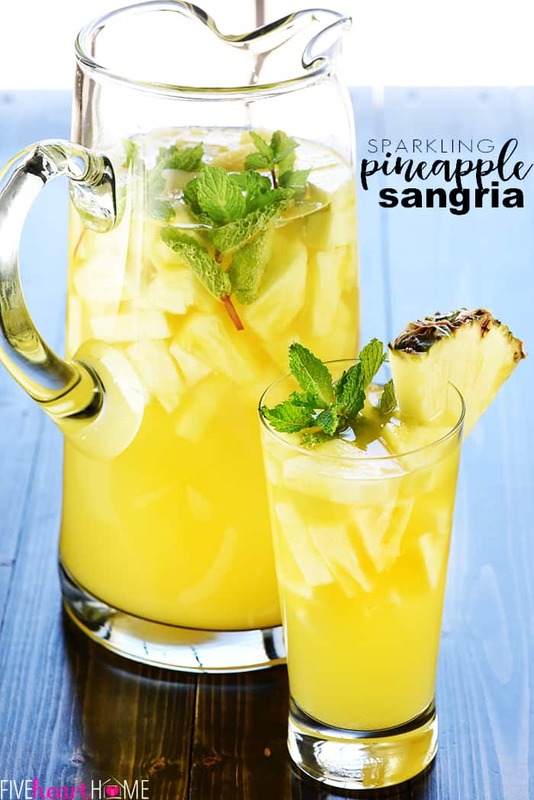 Sparkling Pineapple Sangria is so simple to throw together but it’s absolutely divine…light and fruity and bubbly and YUM. 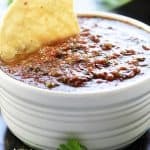 You know what this recipe would be perfect for? Lounging by the pool. Packing in screw-top jars and popping in a picnic basket. 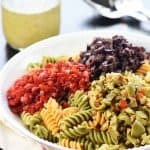 Whipping up for Memorial Day or 4th of July festivities. Enjoying at barbecues or block parties or other get-togethers. Serving at a bridal shower or ladies luncheon or family reunion. I prefer using Prosecco to put the sparkle in my sparkling sangria. But you can use your favorite bubbly depending on how dry or sweet you prefer your sangria…champagne or sparkling moscato or even sparkling rosé could be other options. Or, if you want sangria without the bubbles, substitute your favorite sweet white wine (like Reisling) or dry white wine (like Pinot Grigio or Sauvignon Blanc) instead. While I did peruse organic options for the pineapple juice, they were all fairly dark and cloudy looking…and I wanted my summer sangria to be a festive, sunny shade of yellow! So I read the label on a regular ol’ can of Dole pineapple juice and found that’s it’s all-natural and non-GMO with no added sugar in a BPA-free can (this is not an ad…that’s just what I discovered). Sold! Alternatively, you can use vodka or brandy in place of the rum. A bit of lemon-lime soda is added to this Sparkling Pineapple Sangria for extra bubbles and sweetness. But if you can find pineapple soda, it would be a yummy substitute. And finally…the pineapple! 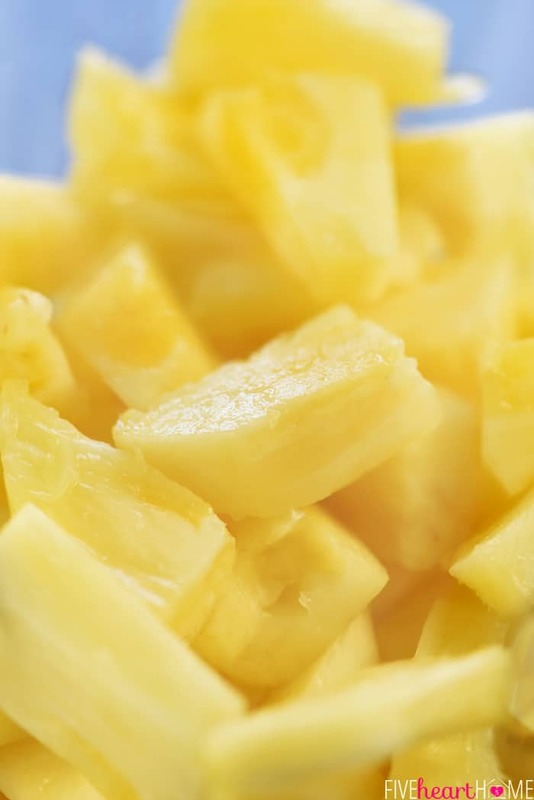 I highly recommend using a fresh, ripe pineapple, since it’s typically sweeter than frozen. You can use an entire pineapple in your sangria, but I only added about half of a (giant) pineapple to the pitcher seen in these photos. I left the skin on a quarter of said pineapple and sliced it into wedges for garnishing my glasses. And then I saved the remaining quarter pineapple for my kids at breakfast the next morning.? That being said, frozen pineapple will work in this sangria if you don’t have fresh. 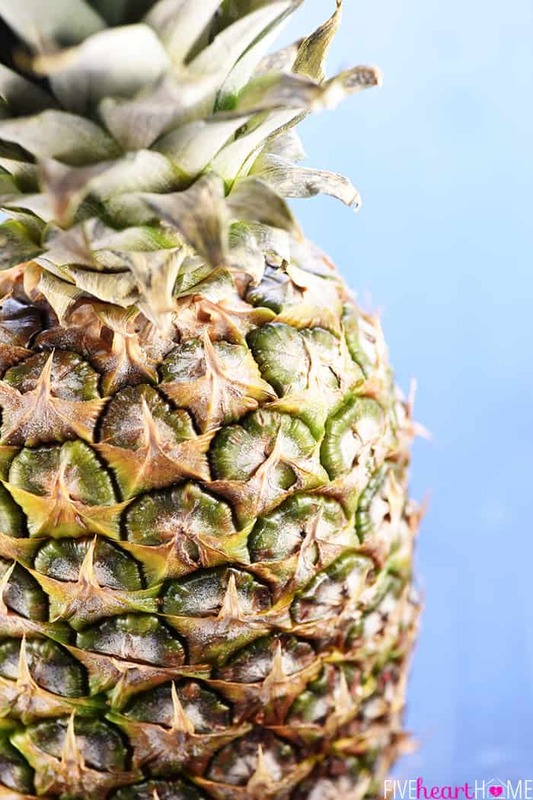 But my best advice is that if you do have a fresh, sweet pineapple, cut it into chunks (or rings, if you’re feeling fancy) and pop it in the freezer for a good while before adding to your sangria. This will help your pitcher of deliciousness stay nice and frosty! 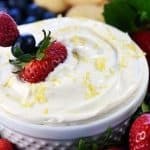 You could also choose to add other fruit along with your pineapple. Strawberries pair nicely with pineapple, or cherries would be fun and festive. Or go all-out tropical by tossing in some diced mango! Typically, sangria is assembled ahead of time to give the wine a chance to soak into the fruit. 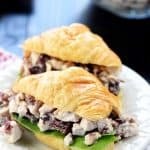 But since we’re dealing with bubbly in this recipe, you don’t really want to add the Prosecco before hours of chilling or you run the risk of losing those beautiful bubbles. So since Sparkling Pineapple Sangria is so quick to throw together, simply start with chilled ingredients and assemble right before serving to ensure maximum sparkle. 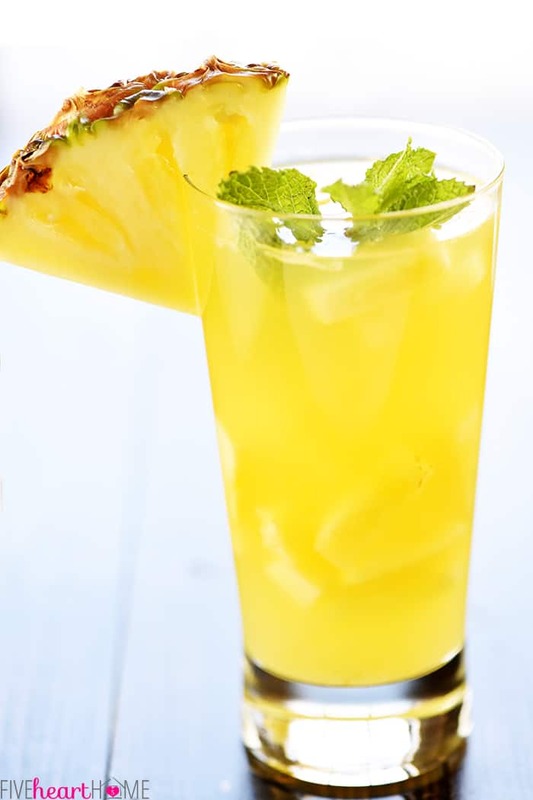 Orrr — for booze-soaked pineapple — you can add the pineapple chunks to your pitcher, pour the pineapple juice and rum over the top, and pop the pitcher in the fridge for a few hours before adding the chilled bubbly ingredients. Orrr — if you opt to use non-bubbly white wine instead of sparkling — feel free to totally assemble and chill your sangria ahead of time, the good old fashioned way! 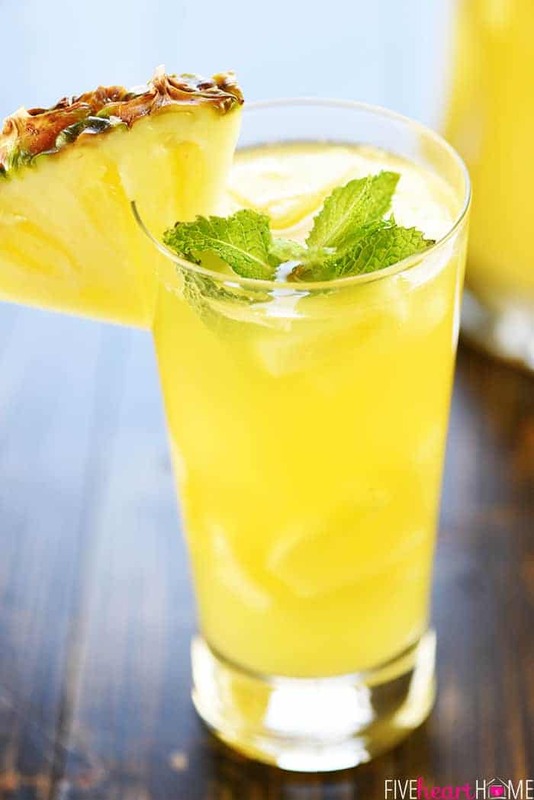 When you’re ready to serve, spoon some of the pineapple chunks from the pitcher into wine glasses or tall iced tea glasses (along with a few ice cubes, if you like) and pour sangria over the top. 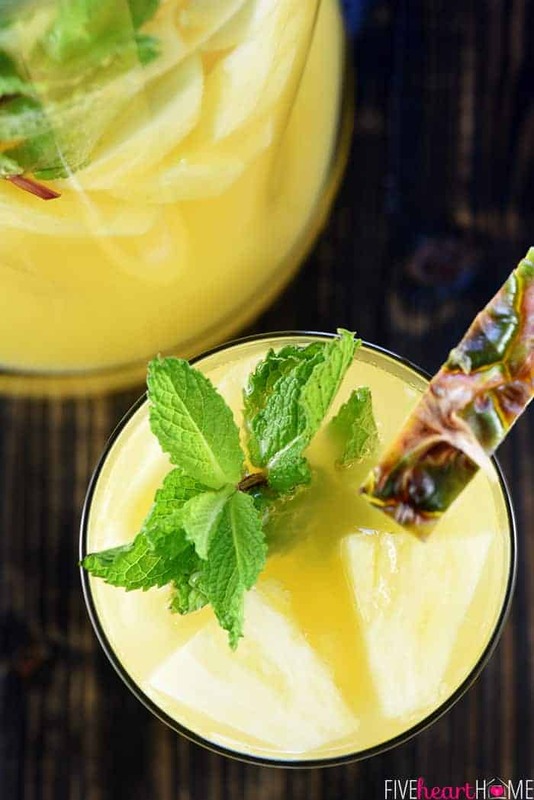 Garnish with mint and a wedge of fresh pineapple and ENJOY. This recipe makes about eight (1-cup) servings of sangria, but the pineapple chunks in your glass/pitcher will obviously take up additional room. Therefore, the pitcher or drink dispenser in which you assemble this sangria should have at least a 3-quart (96-ounce) capacity. For a party, feel free to double or triple this recipe in a large (at least 2-gallon) drink dispenser. 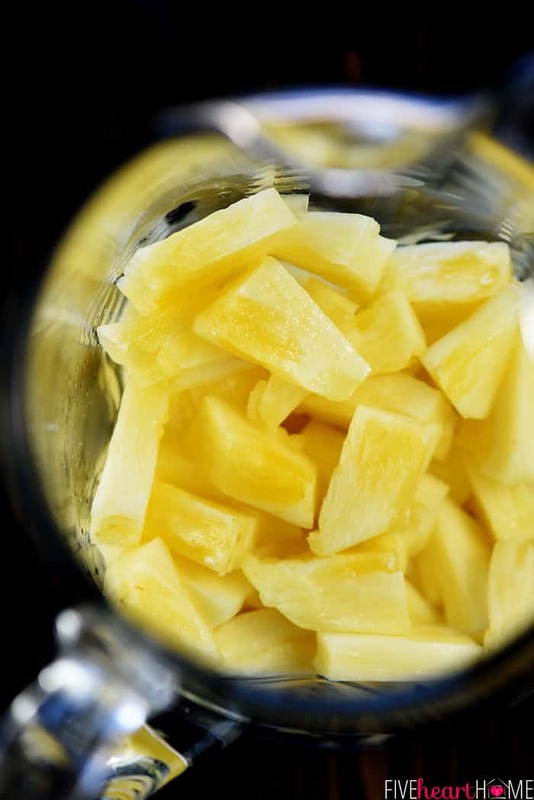 Add the pineapple chunks to a large (at least 3-quart) pitcher or drink dispenser. 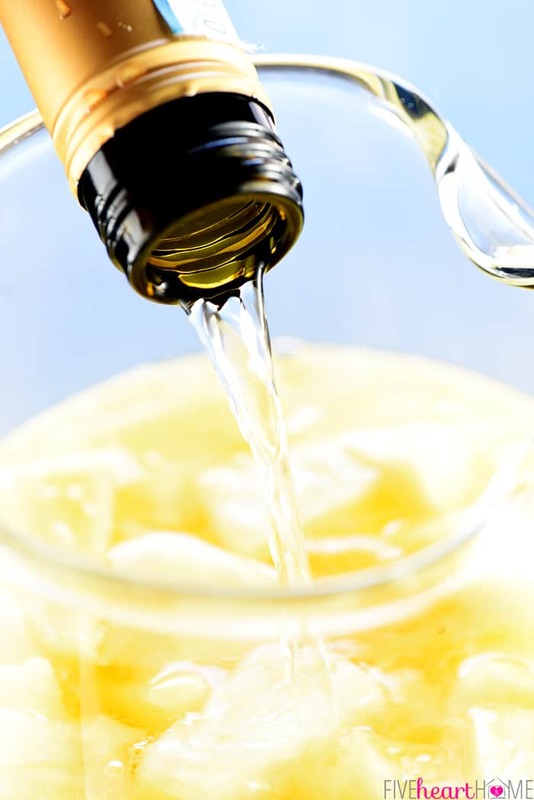 Pour the pineapple juice and rum over the top. Slowly add the Prosecco and lemon-lime soda and gently stir to combine. Spoon some of the pineapple into a glass then pour sangria on top. 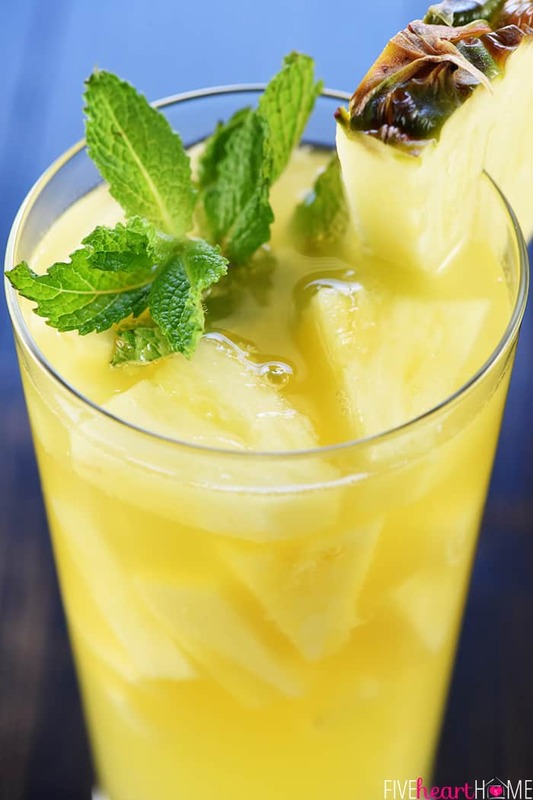 Garnish glass with a sprig of fresh mint and a wedge of fresh pineapple, if desired. This sangria was delicious! I’ll be drinking it all summer long.